As you record & edit in your session the Region List down the right end side of the Edit window will get bigger and bigger. The size of this list can impact on Pro Tools’ performance. 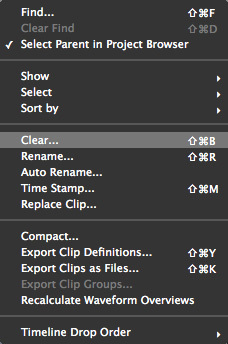 If you notice Pro Tools is getting slower then it might be time to prune the Clip List. Firstly Save your session and then do a Save Session As. That way if you want to get back any of the clips at some point in the future you have a copy of the session with them in. To remove unnecessary audio files from the audio regions list, click on the arrow on the right hand end of the Clips top bar and a drop down menu will appear. and then Remove and all the unused clips will be removed from the session and your clip list will be a little shorter. You may want to choose the Unused Except Whole Files option. This will leave the original files in the list even if they are no longer used in the session as this can make finding original content from the unedited clip easier.